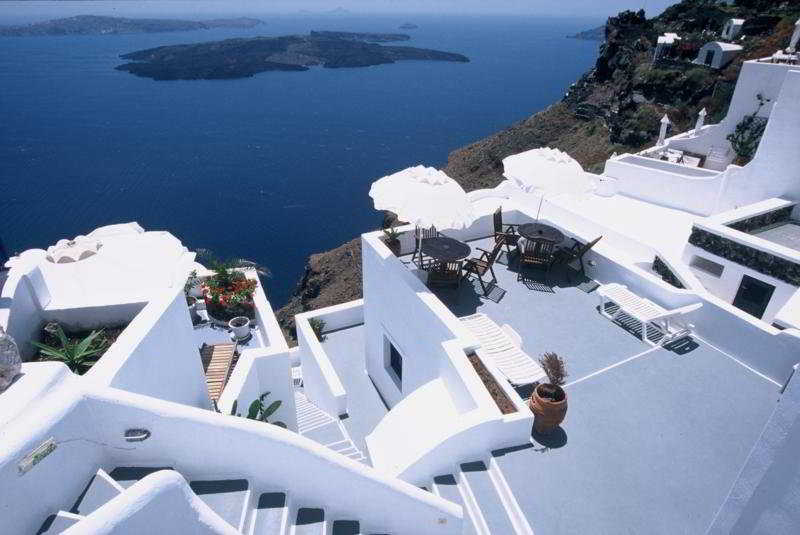 Find huge deals in Santorini, Greece that you may book now & pay later! 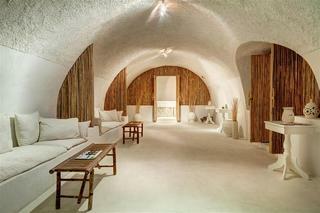 Best prices for in Santorini, Greece. A dream vacation for you and your family, guaranteed by our travel consultants. For members-only deals, we recommend using the new filter for deals in Santorini, Greece. 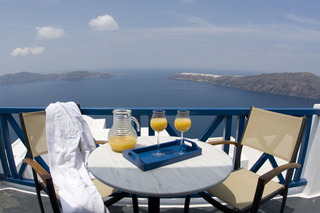 Conveniently located in Thira, capital of Santorini, this hotel is a great base from which to explore this vibrant city. From here, guests can enjoy easy access to all that the lively city has to offer. The hotel is just steps away from the city's numerous attractions such as the excavations of the Minoan eruption, and Pyrgos Village. This recently refurbished hotel is very well located beside the cathedral, approximately 200 metres from the centre of Fira. Within the area guests will be able to find a number of leisure and nightlife options, as well as a variety of taverns and restaurants of local character. This is a perfect place to stay if guests wish to experience the more lively side of the island. 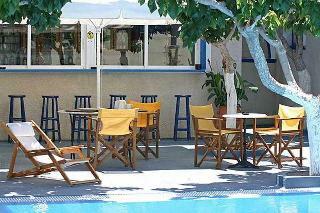 This 4 star hotel is located in the city centre of Santorini and was established in 1954. It is close to the Museum. The Hotel has a restaurant, a bar, a conference room, a coffee shop and an outdoor swimming pool. 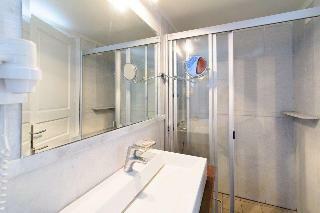 All 25 rooms are equipped with minibar, hairdryer and air conditioning. This beautiful hotel, built in a traditional Cycladic style, is located just 50 m from the beach of Kamari, a bustling and touristic area full of bars, restaurants and shops suitable to all tastes. 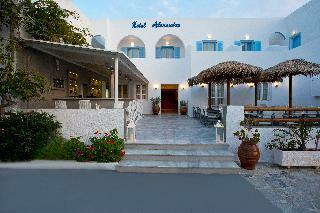 It is approximately 9 km from Fira and Athinios harbour is about 11 km from the hotel. The airport can be found less than 4 km away. This charming hotel, built in traditional Greek style, is beautifully set in a quiet and secluded area surrounded by vegetation outside of Kamari, and is within walking distance from one of the most famous black sand beaches of the island. 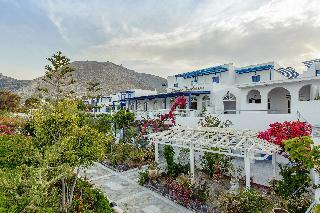 Fira can be reached by car, since it is approximately 9 km away and the airport is about 5 km from the hotel. If guests are looking for a place to really get away from it all, then this is it. 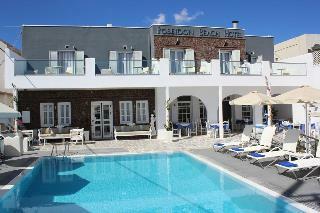 This newly built hotel enjoys a very nice location just 400m from the centre of Fira, the capital of the island. 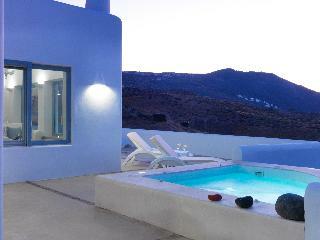 It offers its guests wonderful views of the volcano and of the sunsets, quite famous in this side of the island. Athinios harbor and the airport lie 8 km away. The renowned pebble beach of Kamari can be reached by car or public transport. 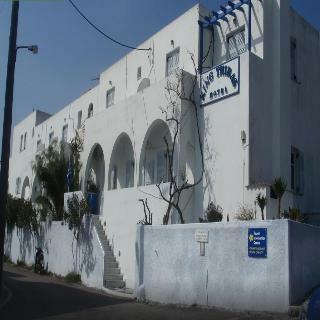 This family run hotel surrounded by beautiful gardens enjoys a very good location approximately 100 m from Kamari Beach. Guests can walk to most places in the area, the boulevard with restaurants and shops and also the bus stop that links with most villages can be reached on foot. Fira can be found at less than 12 km. This family hotel provides the ideal venue for a peaceful, comfortable holiday. This wonderful hotel, built in Aegean style with 70's linear design forms, enjoys a perfect location at the quieter end of the main strip in Kamari. 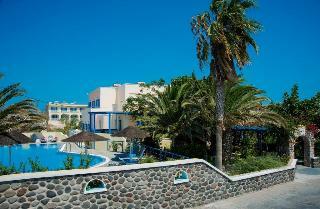 Within walking distance guests can reach the famous volcanic black sand beach. In the immediate vicinity guests will find a series of shops, supermarket and restaurants. Fira is approximately 9 km away. This is the perfect hotel for endless hours of leisure by the sea. 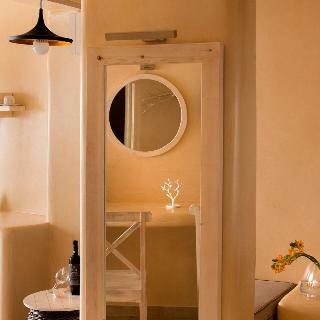 This hotel, built in traditional Cycladic style, is located in the south coast of the island, approximately 50 metres from the famous beach of Perissa. Fira is around 18km from the hotel, where guests will find a more lively and touristic atmosphere with a variety of bars and taverns of local character. 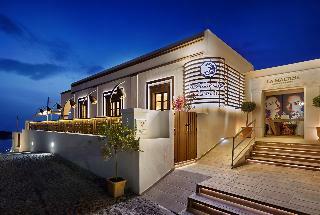 The hotel offers a friendly service along with a comfortable stay that will guarantee a memorable holiday. 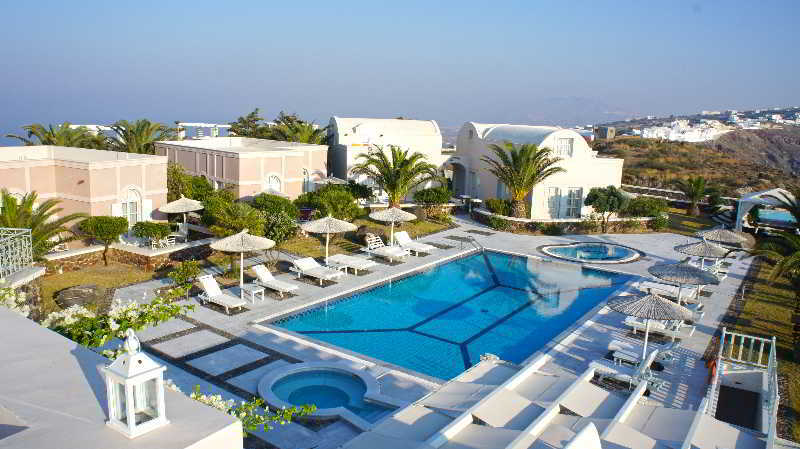 This town hotel is very nicely situated a few minutes' walk from the town centre of Fira and offers its guests wonderful views to the Aegean Sea. The closest beach lies around 6 km from the hotel. 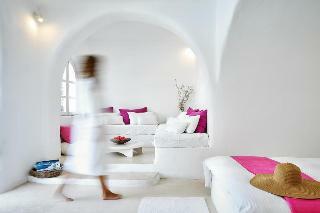 Guests may rent a car or take the public transport to visit most historic sites of touristic interest on Santorini. This is a wonderful place to relax after a long day exploring the island. This friendly hotel is beautifully located on the eastern side of the island, around 200 m from Kamari round-pebble beach in Agia Paraskevi. In Kamari guests will find a variety of bars and restaurants and in Thira, the capital, a wide range of leisure and nightlife options can be found. This is a perfect hotel for guests who wish to relax and have fun at the same time. This luxurious and comfortable hotel built in traditional Cycladic style and surrounded by gardens, is superbly set a stone's throw from the black sand Perissa Beach. From here, guests can enjoy easy access to all that the lively city of Perissa has to offer. 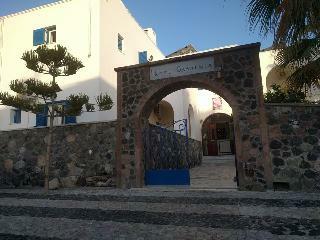 The centre of Fira is located around 10 kilometres away. 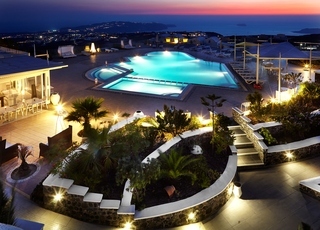 The hotel is a good choice for a short break on the island of Santorini.